The other morning I woke up thinking about crab. I'm sure it was the Surimi sandwich I made last week that set my subconscious mind going. If you subscribe to dream symbolism, it may just mean that I'm crabby or unable to address my own difficulties. It could also mean that I'm craving intellectual nourishment. More realistically though, it probably means I'm craving physical nourishment from the sea. Well, it so happened that we were having some people over for a night of cards. Euchre, being our card game. It's a regional game played in the Mid-West & Mid-Atlantic area that is usually attributed to being popularized by the Pennsylvania Dutch. Every now and then you'll excitedly find someone you have met is familiar with the game and it becomes an amazing bonding point and conversation igniter. Sorry for the digression. The important thing is, Euchre is a four person game. Therefore, I had to come up with something fairly simple and good for a four person group. Lucky for me I had crab on my mind and crab cakes sounded like the right call. I knew the ones I wanted to make, too. I had made them last year after reading The Wednesday Chef's posting on crab cakes where she spoke of Regina Schrambling's LA Times article on the same topic. It's so good, I thought it's worth writing about again. Side Note: I remembered Regina's article because she takes a dig at surimi, calling it, "that crime against nature." That's not very nice, now is it, Regina? Back to the crab cakes. I had been toying with a couple different recipes in the past and this current reading had focused my efforts. The key for me with crab cakes is that they be simple. No peppers, celery, etc. All crab and very little filler. Just thick giant luscious pieces of crab meat barely held together by some egg, panko, a little mayo and minimal spicing. You don't want a greasy bread bomb. You want a crab cake. Therefore, jumbo lump crab meat is the only real option. If you're going to make these, commit to it. It's not cheap, but it's good. 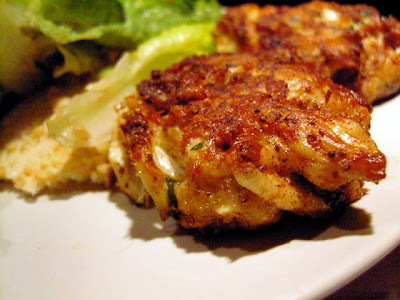 These particular crab cakes go against the ancient origins of crab cakes or minces. Minces were created for economy as well as to add flavor. There isn't much economy or added flavor in these, but there is a lot of crab flavor. After all, they are called "crab" cakes. Be gentle with these crab cakes, they will not want to stay together. The key is to keep the crab pieces as whole and unbroken as possible and to chill them right after you combine them for an hour before cooking. The chilling helps them to stay together when you cook them. I think these cakes are great served on their own with some freshly squeezed lemon or with any sauce with some creaminess and spice. I thought avocado would go well and give me the creaminess I wanted without having a mayo based sauce. Our guests we were having over had what seem to be the typical mayo aversions. They didn't need to know about the small amount in the cakes, but the sauce would have been too much. When did mayo become such a bad thing? Regardless, Regina had an Avocado-Tomatillo sauce in her article, similar to a Bobby Flay sauce I had tried before which seemed perfect for an accompanying sauce. I adapted mine from a combo of both of theirs. 1. Pick over the crab meat to remove any cartilage, trying not to break up the chunks. In a bowl, gently toss the crab meat, shallots, parsley, panko and Old Bay. Again, try not to break up the crab. 2. Gently fold in the mayonnaise. Season with salt, pepper, lemon juice, and tabasco. Taste and adjust the seasoning if needed. Add the lightly beaten egg and fold just until the mixture is well combined. 3. Shape the mixture into eight fat ball-like cakes. (They will flatten slightly during cooking.) Place them on a platter or a baking sheet lined with wax paper. Drape a second sheet of wax paper over the top. Refrigerate for 1 hour. 4. In a large skillet, heat the butter and oil over medium-high heat. 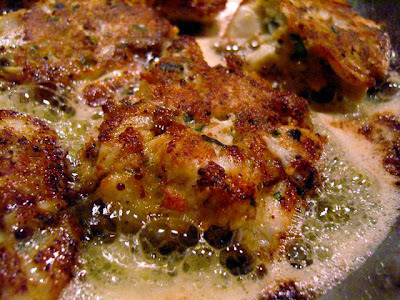 Carefully lay the crab cakes into the butter and oil and fry until crusty and browned, about 3 to 4 minutes on each side. Drain quickly on paper towels. Serve hot, with a chilled sauce or fresh squeezed lemon juice. Preheat a broiler or grill. 1. Lightly coat the tomatillos and chiles with oil and season with salt and pepper. Broil or grill the tomatillos and chiles till blackened on all sides. When blackened and soft, coarsely chop the tomatillos and stem, seed and chop the chiles. Be careful. They will be very hot. 2. Combine the tomatillos, chiles, cilantro, onion, avocado and lime juice in a blender. Add 1/2 tsp sea salt. Purée until smooth. Taste for seasoning. Serve either warm or chilled. Note: If the tomatillo sauce is too tart for you, try adding a little honey. But, you'll have to blend it again after adding. We served the crab cakes with a caesar salad, fresh smoky margaritas and my wife's version of my Grandmother's apple dumplings with homemade ice cream for dessert. Delicious evening. Oh, and some champagne as an apertif. The guys got killed by the girls in the card game, if you're interested. Every now and then I crave Surimi. You may know it as Imitation Crab. I know it as delicious, sweet, chewy and shaped into a number of different personas. Since 2006, it's no longer known as "imitation." Now, they'll (The U.S. Food and Drug Administration) refer to it as "crab or lobster-flavored seafood, made with surimi, a fully cooked fish protein." Basically, it's heavily processed fodder fish that is low in fat and high in protein. Pretty healthy. I got into it when I was in college and looking for healthy cheap options for meals. It became a standby for me. 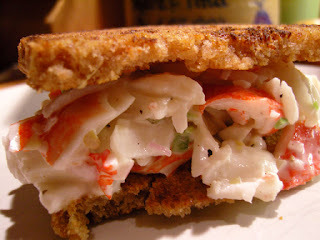 Surimi shows up mostly in the U.S. in California Sushi Rolls, but it can be used in a myriad of dishes and sandwiches, such as the Lobster Roll I decided to make. Surimi was created by the Japanese nearly 1000 years ago. It was perfected by a Japanese chemist in 1960 and helped to revitalize the Japanese fish industry. Harold McGee, in his book On Food and Cooking, explains it as follows, "Surimi is made by finely mincing fish scraps (today, usually pollack), washing them, pressing them to remove the wash water, salting and seasoning the mince, shaping it, and boiling it until it solidifies. Washing the mince removes nearly everything from the muscle except the muscle fiber membranes and contracting proteins. Salting then dissolves the protein myosin out of the muscle fibers, so that when it's heated, the myosin will coagulate into a continuous, solid, elastic gel in which the other fiber materials are embedded. The result is a flavorless, colorless, homogenous matrix that can be flavored, colored, and formed to imitate nearly any seafood." See. Easy as pie. Kind of like hot dogs. Or as McGee says, you're eating a "Matrix." Yum! For more info on the process click this link. I used the lobster flavored surimi in chunks and broke that up a bit in a bowl. I added a diced shallot, a very small amount of organic mayo, lime juice, 1/2 a minced jalapeno, sea salt and freshly ground pepper. I didn't have a hot dog roll or brioche. I went healthy, with sprouted grain bread - though, I did butter it and grill it. Simple sandwich and simply satisfying. I've been waiting for an appropriate reason to make a first posting for sometime now. I was hoping for something "egg" related to justify the blog's title. So, the other evening I made Short Ribs Braised in Chimay Ale from Judy Rodgers' fantastic, The Zuni Cafe Cookbook, and the opportunity for a posting revealed itself. I had some leftover ribs and cooking juice and saved it for the next morning. Judy mentions a way to use the leftovers in the ribs recipe, Eggs Baked in Restes. I tried it the next morning. It was luscious, rich and completely satisfying. The only adjustment to my leftover cooking juice was to add a bit more beef stock and some Carpano Antica Italian Red Vermouth, which I will elaborate on further below. In regards to the Short Ribs recipe, it is really really good, but next time I will increase the proportion of beer to beef stock used and possibly a bit richer beer than the Chimay Red Label ( go for something with a tad more sugar, but definitely stay away from something too hoppy. For instance, Maredsous Brune, Bornem Dubbel or Lozen Boer Abt. ) I also did not do the mustard glaze. I just simply broiled the ribs wet with beer jus and that worked fine. Judy is very big on pre-salting meat and letting it rest overnight. Her Roast Chicken recipe which utilizes the pre-salting is close to perfection. Everyone should try it at least once. Choose a shallow baking dish appropriate to the amount you are making. I used a small cast iron pan. 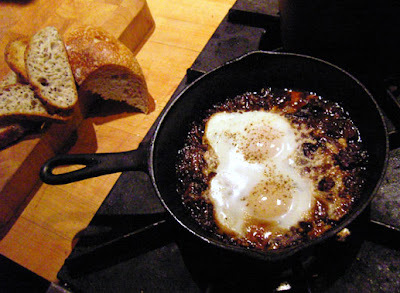 The leftover braising liquid should be about 1/2 inch deep in the pan before eggs are added. Reheat the braising liquid on the stovetop in your cooking dish over medium heat. Reduce heat and stir in meat scraps and vegetables. Bring to just a simmer. Reduce till the liquid is almost the consistency of maple syrup. Be careful that it doesn't become to salty from reducing too far. Thin more as needed if it is already too thick with beef stock, sweet vermouth or Chimay or other beer originally used. If too acidic, add a pinch of sugar. Crack the eggs into the center of the pan. Barely prick the surface of the yolks to help prevent them from setting a rubbery skin. Cook on the top rack of the oven and bake for approximately 5-7 mins. I served it right out of the pan with toasted garlic rubbed bread drizzled with grassy olive oil and black pepper. Carpano Antica is the "ancient formula" red vermouth made by Branca Italian Products. It has been hard to get in North America, but it's not too hard to track down. Branca is known more so for their popular digestif Fernet - Branca. 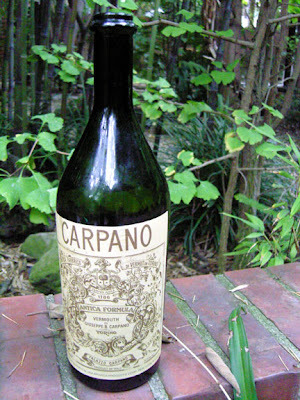 Carpano Antica sets itself more as an apertif, but holds it's own as a digestif or dessert wine. It incorporates similar botanicals as some Bitters such as Amaros, but it is more pleasant, sweet and full. Some consider it the best of red vermouths. It's great in many cocktails, Manhattans, Negronis, and what some consider the true Martini, gin and red vermouth. I also love to use it in a tequila cocktail, La Rosita. Serious Eats has a nice article on vermouths if you would like to know more. Fill a shaker 2/3 with ice. Add the ingredients and shake several times. Strain into your favorite chilled glass. 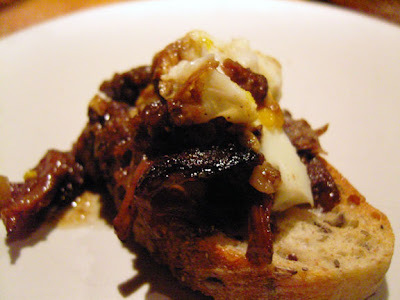 I know some of you will be asking where the Short Rib recipe is. Well, it's in The Zuni Cafe Cookbook, which I think is a must have on your book shelf. I'm going to put together a post of what I consider to be the essential books for any cook's library sometime soon. Until then, I'll give you this link because I don't think it's right to post more than one recipe from a book at a time. This is a link for the Short Ribs in Chimay Ale. The only difference in how I prepared it is: I used a combination of Chimay Red Label and Beef Stock, I used white peppercorns, and I used regular cut Short Ribs I had the butcher at Whole Foods cut for me instead of the Flanken Ribs / Korean style Ribs. Also, I didn't use a slow cooker. I did it per the recipe and braised in the oven at 300 degrees for 2 & 1/4 hours.